5 bedrooms, 2 1/2 baths, sleeps 13, great for groups & families! Looking for the perfect summer getaway for your group in southern Vermont’s lakes region? The Brook House at Echo Lake – a spacious, non-smoking, five-bedroom retreat with hot tub, Jacuzzi bath and loads of amenities – is perfect for large families, reunions or groups of friends! The house’s proximity to Echo Lake Inn (a two-minute walk) makes it a great place for family and friends to stay during a wedding weekend. The house sleeps 13 (including two sofabeds). Enjoy an exhilarating day swimming, kayaking, fishing, hiking, golfing or bike riding, then gather in the hot tub on the back deck that overlooks state forest land and listen to the babbling brook. Enjoy the fireplace, hot tub, outdoor fire pit, horseshoes, volleyball and more. The large yard provides a great playground for your group. The Brook House – actually “Little Brook House at Echo Lake” – is not little! It gets its name because Little Brook flows just behind it. Hike three miles up 2,320-foot Tiny Mountain, and you’ll find Tiny Pond, which makes a great day hike. Look for the moose who live up there! The house has an interesting history – it actually started as a chicken coop over 150 years ago! During the 20th century, it was built upward and outward, so that today it’s a spacious, comfortable home perfect for large families, reunions or groups of friends. Some of the original wood remains around the fireplace, and the built-in shelves limit the size of the flat screen TV in the living room, but you should enjoy the rustic ambience. Little Brook House is a five-minute walk from Echo Lake, and the Black River is across the street – both the lake and the river offer excellent fishing. Of course it’s fun to splash in the creek out back! 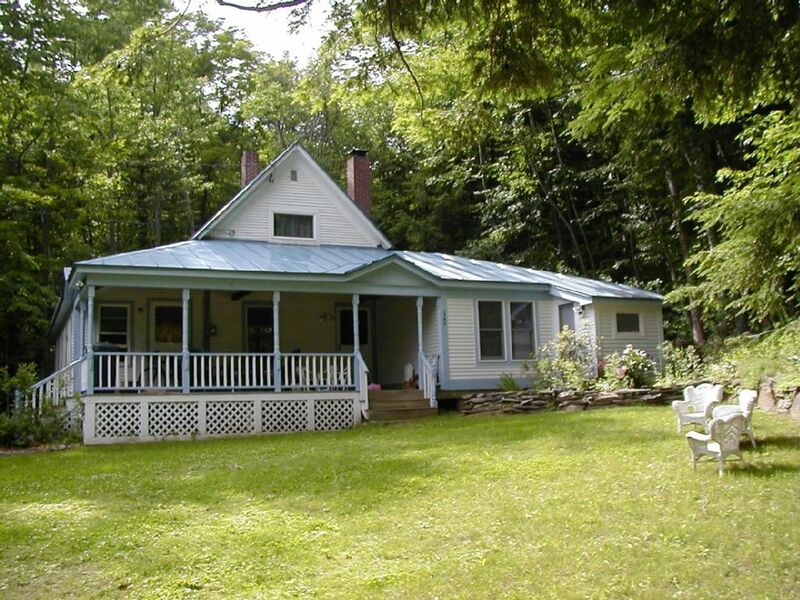 Relax in the Adirondack chairs on the front porch on lazy summer days, or gather in the hot tub on the back deck that overlooks state forest land listen to the babbling brook. Kids love to play in the creek, hike in the back woods (hundreds of acres with a series of waterfalls and gorges), play volleyball, horseshoes, bocce or croquet, ride the tire swing, kick a ball around the expansive lawn, and catch snakes and salamanders. Cross the street to the Black River and catch a few fish. Rent a boat or paddleboard at the store across the street and they’ll take you to the lake of your choice! 9% VT lodging tax, and $200 cleaning and hot tub fee will be added to total rent. We're a family of nature lovers -- skiing in the winter; boating, hiking, running and biking in the summer! We are currently traveling the world in retirement. Our oldest is going to college in England and our youngest plans to attend Champlain College in Burlington, VT. We get to Vermont whenever we can! We love its rich history -- and the feeling of getting away from it all combined with the community feel of being located at the edge of the tiny village of Tyson, at the northern tip of Ludlow, with the convenience of the Village Store just across the street! The creek out back! The day hike from the house up Little Brook to Tiny Pond -- look for the moose that resides there! The Country Store across the street and its friendly owner, Spanky. Downtown Ludlow is five miles away. The house is in the Green Mountains and there is hiking out the door. At the edge of the wood, at the edge of the tiny village of Tyson, but four miles form Okemo Mountain Resort and five from downtown Ludlow. The house is at the edge of the tiny village of Tyson, with a little country store across the street. Echo Lake is a quarter mile away, with use of a two-person kayak. There is a creek right behind the house. Echo Lake is a quarter mile away. and the Black River is across the street. 4 miles from Okemo and 11 from Killlington Skyeship! XC nearby as well. Our two-person kayak is at the dock of a nearby Inn, a five minute walk from the house. Fishing in the Black River is across the street; the country store sells licenses, worms and tackle. In central Vermont, 2 1/2 hours from Boston and just four from NYC, there is a place where the mountains are the greenest of green and a string of pristine lakes is the bluest of blue. The fish are always biting in the summer; feathery flakes fall on red-gold leaves in October; and flowers burst into a jumble of audacious color in May. The only thing that beats taking a kayak out on a misty summer morning is screaming down a ski slope after a fresh snowfall. In winter the snow is deep and fluffy from December well into April -- perfect for skiing! With 8 ski areas within 40 miles, you have plenty to choose from. All around you, rolling fields of golden fescue surround bent grass tees and fairways. In the distance, Vermont's Green Mountains provide a striking backdrop. These breathtaking views and access to championship heath land golf are yours at the Okemo Valley Golf Club in Ludlow. Less than four miles down the road, Okemo Mountain Resort’s Jackson Gore base lodge offers a heady assortment of trails from easy to expert. This is a great cruising mountain that families love, but a couple of the double-diamonds will put even experts to shame. Snowboarders will love the terrain parks, quarter pipe and two Super Pipes! Killington Resort stretches across seven mountains with 200 trails and 33 lifts. Averaging 250 inches of natural snow each winter complemented by the country’s most extensive snowmaking system, it has offered the longest season in eastern North America for 43 years. Killington is known for its diversity of terrain. Pico is one of Vermont`s largest mountains, with a vertical drop of 1,967 feet spread over 50 trails and 214 skiable acres that provides lots of choices for all abilities. Holiday weekends (non-winter) and foliage season (first 2 weeks of October) -- $200 surcharge, and Sunday is considered a weekend night. Pets are permitted with a $79 CSA travel ins. pmnt. Traveler must keep dogs on leash and clean up after them in the yard and neighborhood. Holiday weekends have a three-night minimum SCAMMER ALERT: Homeaway and VRBO have had some phishing problems. If anyone asks you to do a wire transfer, it is not us! Call Homeaway immediately to report. We accept Homeaway and VRBO secure credit card payments.